Click on the New variable icon in the toolbar. When creating an integer variable, you also have the option of defining whether it is a metric or a categorical variable. The variable for age, for example, can be handled in various ways: if you want to enter the age in years, you are dealing with a metric variable, for which you may want to establish a mean. If you have defined ages into categories (e.g. 1 = under 18, 2 = 18-30, 3 = 31-50, 4 = 51+), then you are dealing with a categorical variable, for which you would not want to find a mean value. You can also select what value should be inserted automatically for those cases where there is a missing value. This is especially important if you are planning to do a statistical analysis later. Note: Document variables are created for the entire project, which means you cannot create different variables for each document group. For better readability of variable values in MAXQDA, it can often be more convenient to use text variables instead of number variables. In a table column with the variable “familial status”, the variable “married” will be more readable than a numeric code (like “2”). The number of document variables is not limited in principle, that is, variables can be removed from the list or added to the list at any time. This applies to document variables as well as to code variables. By clicking on the New variable button, you can mae new definitions. In the event that you want to define a large number of variables and, if necessary, the values for the cases already exist in a table-like structure or even as an SPSS record, you can save time by importing the file. Tip: To avoid confusion, each variable name should be assigned only once. Statistics programs often don’t allow duplicates anyway. Variables can be given a new name at any time. Double-click on the variable, and enter the new name. 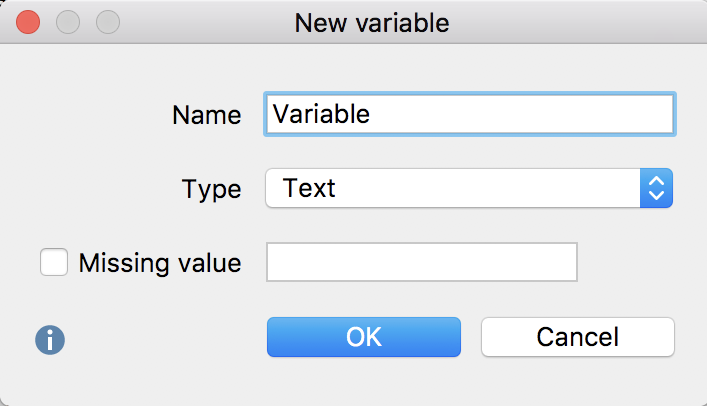 Renaming a variable is possible at any time and does not affect the variable’s stored values. Deleting a variable is done in the same way as renaming it. Select the variable you want to delete with the mouse. Now the focused variable is highlighted in green. Then click the Delete variable button in the toolbar. When you delete a variable, the whole column including all its values will be removed from the table. Document variables, which display how often a code exists (their source is acknowledged as “code”) can be transformed into a binary variable by clicking on the button. After it is transformed the variable will not show, how often a code has been assigned in the document, but if it has been assigned in this document or not. User defined variables “Integer,” “Floating Point,” “Date/Time” and “Boolean” can be transformed into text variables by clicking the .